Grindelia is a valuable remedy for bronchial asthma and where phlegm is a problem, especially congested airways. It is thought to desensitise nerve endings in the bronchial tree and to slow the heart rate, both leading to easier breathing. Is taken for emphysema, bronchitis, whooping cough, cystitis and hay fever. 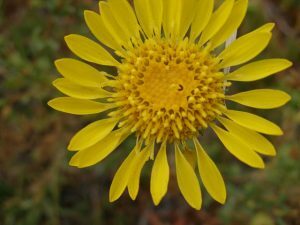 North American Indians used Grindelia to treat bronchial problems and also skin problems such as reactions to poison ivy. In case of kidney disorders, heart failure and gastrointestinal inflammation, do not use internally. Can lead to irritation of the urinary tract and kidney. Excessive doses or long-term application may adversely affect the heart rhythm.